On October 22, 2012, Bridges of Hope Fellowship sent their first foreign mission team to Abidjan, Africa to work with IMB Missionaries, Michael & Heather McAfee. The team returned on November 1st after been held up in Paris, France for two days due to Hurricane Sandy. Abidjan is a city of 8 million people who desperately need to hear the message of hope that Jesus Christ is their ultimate sacrifice. 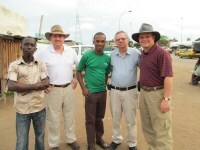 The goal of this trip was to catch a vision for planting churches in West Africa. The team consisted of Pastor DeWayne Howard, David Clayton, and Brent Nunley. They spent months preparing for the trip in which they would be involved in prayer walking, telling the story of Creation to Christ, touring the city, meeting the people of Abidjan, and attending a local church there for worship. 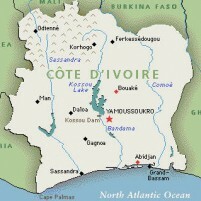 The group primarily worked in an area of Abidjan called Petite Bassam. It is one of the poorest areas of the city. While story telling, Pastor DeWayne led 4 ladies to the Lord. The people were greatly receptive to the message of hope that the team brought from America. All three team testified as to how it had changed their lives for the better. God moved mightily throughout the entire trip and future trips are planned for 2013. For more information on those trips to take place in April and October, please call the church office at 931-815-8870.